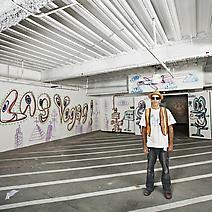 Kenny Scharf was born in Hollywood, California in 1958. Scharf rose to prominence alongside his friends and contemporaries Jean-Michel Basquiat and Keith Haring in the East Village art scene of the 1980s. One of the first artists to inject elements of street culture into the main stream of contemporary art, Scharf has continued to pioneer projects like his Cosmic Cavern—a now legendary all-night DayGlo disco party held in the basement of a Brooklyn warehouse from 2009-2010. His paintings incorporate imagery from advertisements, cartoons and classic Americana into exuberant compositions with an underlying subversive edge. Scharf recently completed a mural wall project on the corner of Houston Street and the Bowery, and will create unique spray-can paintings on 100 roll-up storefront shutters throughout Manhattan for a new public art project by the Mediacy Group’s Gatescapes program. His work was featured in The MOCA LA’s “Art in the Streets” exhibition. Scharf lives and works in Los Angeles and New York.